memoir/essay collection Morningstar: Growing Up with Books. Now, she has given us a memoir about another essential part of her life. Kitchen Yarns: Notes on Life, Love, and Food includes recipes, but it's a book about those moments in her life when those recipes were essential. Hood turns to food for comfort, in grief, in loss of a marriage, in joy. Her memoir is not in consecutive order. It's in order by memories of the heart. No one in Ann Hood's family actually taught her to cook. Her grandmother, Mama Rose, didn't want anyone in her small kitchen. Hood's mother worked while her father was stationed at various places in the navy. It wasn't until she was an adult, working as a flight attendant, that she taught herself to cook with the help of various cookbooks. She turned herself into what she refers to as a "good home cook" by the time she was married and raising a family. M.F.K. Fisher is quoted as saying, "Writing about food is really writing about love." That's exactly what Hood does in this latest book. Yes, she writes about her father's fried chicken, her grandmother's Italian cooking, the potatoes her children made. But, mixed in with those accounts are the stories of living with her grandmother while her father was gone, the loss of her daughter, Hood's divorce, her marriage to the man she loves (a man who knows and writes of food). She shares all of those stories with the reader, allowing us to glimpse her life, her grief, her love of food and family. I mentioned that I identified with Hood's book Morningstar. I don't share that same feeling with Kitchen Yarns. I'm not from an Italian family. My father wasn't career military. I didn't have any of the same career or marriage or family experiences Hood did. But, Ann Hood and I are the same age, and there are moments of familiarity when she talks of television or fads or books, and, even at times, food. There were moments when I teared up because of that familiarity. Throughout the book, Hood mentions the authors who are touchstones of food writing, M.F.K. Fisher, Laurie Colwin, Ruth Reichl. Hood brings the reader into the "home" in home cooking, though. She says, "Each essay stands alone, but taken as a while, they make a life - mine." Hood's new book about family and home, loss and love, and food, "is really writing about love", and her book is a gift of love to every reader. 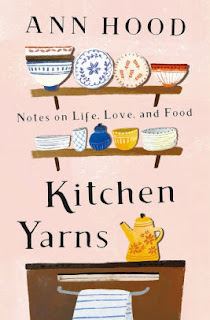 Kitchen Yarns: Notes on Life, Love, and Food by Ann Hood. W.W.Norton & Company, 2018. ISBN 9780393249507 (hardcover), 256p. FTC Full Disclosure - The publisher sent me a copy of the book, after I requested it. I hope you enjoy it, Sandy! Thank you for this Lesa. I come from an Italian family and my husband was career Army. It is ready for me to pick up at the library. I think it will move to the top of my TBR pile. You're welcome, Sharon. I don't think you'll regret moving it up there. It's already on my library list...no connections with me except the food.